At Stanford Health Care, we seek to provide patients with the very best in diagnosis and treatment, with outstanding quality, compassion and coordination. 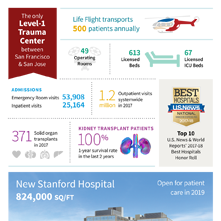 With an unmatched track record of scientific discovery, technological innovation and translational medicine, Stanford Medicine physicians are pioneering leading edge therapies today that will change the way health care is delivered tomorrow. As part of our spirit of discovery, we also leverage our deep relationships with luminary Silicon Valley companies to develop new ways to deliver preeminent patient care. Learn about our awards and significant events. Stanford Health Care is creating new delivery models, leveraging our advanced resources to create seamless continuity of care for every patient. From our suite of virtual care services – to our primary care offices throughout the Bay Area, outpatient clinics in Redwood City and Palo Alto, and our future Stanford South Bay Cancer Center – people from around the region and around the world turn to Stanford Health Care for comprehensive solutions to meet all of their health care needs. At the center of our health system will be the most advanced hospital in the world. The new Stanford Hospital will make our bold vision for compassionate, coordinated, leading edge care – personalized for the unique needs of every patient – a reality for more people than ever before. We dedicate considerable resources to improve the health and well-being of the community. We are responsible for some of the most important medical advances of the 20th century, and we continue building on our legacy in the 21st. We are committed to providing, clear, accurate and honest information about our quality of care, so that patients can make informed health care decisions. 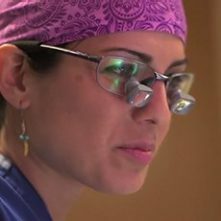 Obtain information about Stanford Health Care's bond programs and finances. Every dollar you give grows exponentially. Your gift empowers us to provide leading edge care to our community and the world.